Here at Deer Creek Door Service our expertly trained technicians can handle every garage door repair job in the Arvada, Broomfield, Castle Rock, Centennial, Golden, Highlands Ranch, Ken Caryl, Lakewood, Littleton, Morrison, Northglenn, Parker, Park Meadows, Roxborough, Colorado area no matter how big or how small! We combine years of experience and knowledge with state-of-the-art tools and equipment, and the best materials in the industry to provide our customers all over the Arvada, Broomfield, Castle Rock, Centennial, Golden, Highlands Ranch, Ken Caryl, Lakewood, Littleton, Morrison, Northglenn, Parker, Park Meadows, Roxborough, Colorado area with the ultimate service in garage door repair! 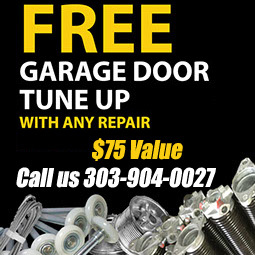 • Garage door tune-ups and more! These are just a few of the garage door repair jobs that our trained technicians can handle, but no matter what your repair needs are, here at Deer Creek Door Service we have the means and the know how to fix it with confidence! Our garage door repair service doesn’t only come in handy after an accident or problem with your garage door occurs, here at Deer Creek Door Service, we offer comprehensive inspections on all types and brands of garage doors and their accessories to make sure they are in perfect working order to save you money and time in the long run! No matter what type of garage door repair you are in need of in the Arvada, Broomfield, Castle Rock, Centennial, Golden, Highlands Ranch, Ken Caryl, Lakewood, Littleton, Morrison, Northglenn, Parker, Park Meadows, Roxborough, Colorado area, the professionals here at Deer Creek Door Service can handle the job in no time flat! Contact us today to discuss a free estimate and to get all of your repair needs taken care of by the best in the business!